Everything seems to be going ok, touch wood. 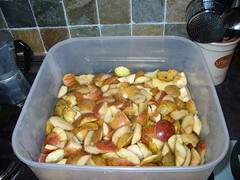 Moved it out of the bucket after 4 days, then strained it into the demi john. 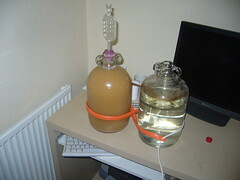 Remembered to put water in the air lock this time and it is plopping away nicely. We (he, mostly!) cleared the old "compost heap", which was mostly full of rubbish and then put the vines in the ground. We attempted to put up a greenhouse, but failed miserably..... going to have to save up my pennies I think, so I can afford to buy a new one, with proper instructions! Next garden job is clearing the remainder of the lawn, so I can dig it over, ready for next season.... should be a fun job! 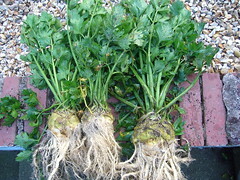 Well dug up some of my Celeriac, looks ok very rooty, but I've never grown them before, so not sure if that's ok or not! Given this lot to my mum, who said she'd make some stilton and celeriac soup out of them, which we would split 50/50! Seems like a good trade to me! I've thought I'd give it another try. Need to perfect it before my vines start to become productive (Would help if I cleared the space where they are going into the ground first!) so should have a good few years yet! 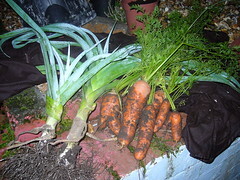 Had the first of my leeks last night and the last of my carrots! Leeks were very nice, I haven't got many in and these were the smallest of the ones I have got, but still they were well formed and tasty. Must remember to grow more next year. 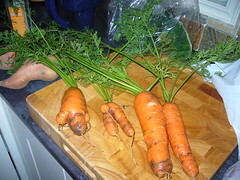 Got the last of the carrots out as well, they had been left in a bit too long, bit tough, not nearly as sweet as the first few I had. I made soup http://www.bbc.co.uk/food/recipes/database/carrotandcorianderso_1919.shtml with them though, so they were fine for that. Why are odd shaped veg still funny? ?